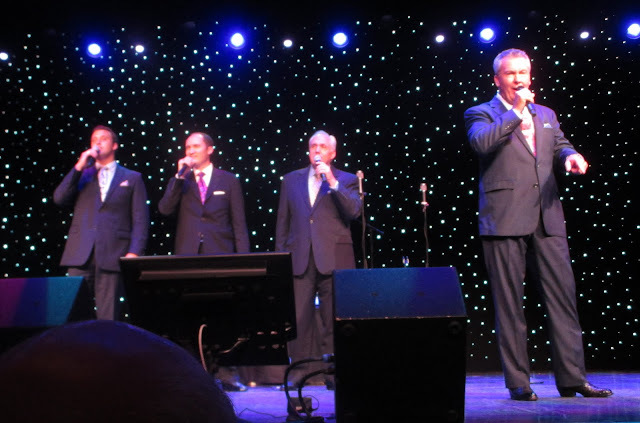 Finally, a little break in the weather occurred yesterday that allowed us to take full advantage of one of the most interesting sights of the cruise. The Westerdam eased its way for about 25 miles inland in the Tracy Arm Fjord, en route to the Sawyer glacier at its end. It seemed odd for the huge ship to be threading its way up the ever-narrowing strait, its confines exaggerated by the sheer rock cliffs jutting upward 2,000 feet or more on each side of the vessel. Once the other liner had passed, the captain slowly eased ahead, occasionally turning slightly to avoid an ever-increasing number of small icebergs that had calved off the glacier ahead. As we approached the glacier at the end of the fjord, the ship turned sideways in the channel to allow a broadside view of the jagged blue ice that was the end of the glacier on its slow but inexorable journey down the mountain to the sea. As we arrived, the sun finally broke through the overcast for the first time since our departure from Juneau and illuminated the glacier very nicely for some good photography. As we stood there, taking in our first close sighting of a glacier, a huge chunk of ice, easily the size of a multi-story building, suddenly broke away from the glacier and fell downward and outward, crashing into the sea, as if in slow motion due to its size. A few seconds later, a sound like thunder reached the ship and a small tsunami-like wave began racing away from where the ice had impacted the water. The passengers collectively gasped at the spectacle, at once realizing they had witnessed a large calving that most visitors do not get to see. Naturally, we were thrilled and, although I did not get a photo of it, it will be etched in my memory, and I thought that it almost made up for the bad weather that had plagued us up to this point. 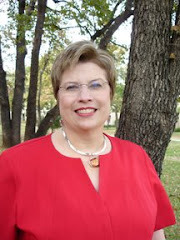 I'm becoming painfully aware of the limitations of an iPad when it comes to posting to my blog. As some of you may remember, my MacBook was stolen last year in Pigeon Forge, and I replaced it with a Dell all-in-one PC that lives permanently in Phannie. I like the large screen, but it is not portable. I rarely need a laptop and figured the iPad would suffice for those few times when I need a computer outside of Phannie. So far, that has proven to be true, except I've found that posting to the blog and dealing with photos is annoyingly clumsy on the iPad and, while wireless Internet is available all over the ship, it gets quite slow at times when it's in heavy use. I'll just add the photos when I get back to Seattle. The stop in Juneau was dampened--if you'll pardon the expression--by persistent light rain, low clouds and fog. 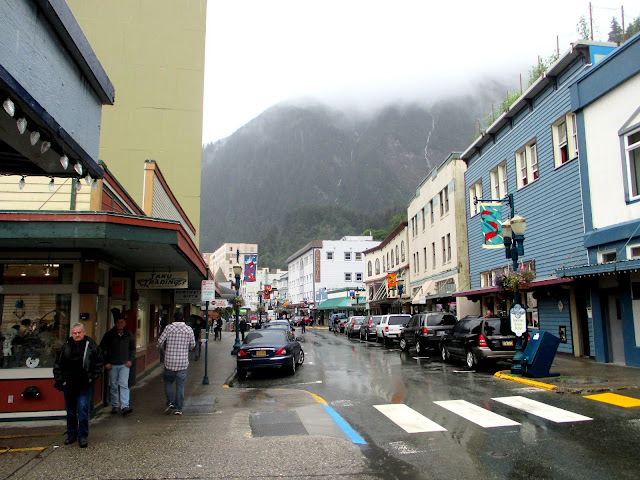 Nevertheless, we were able to leave the ship and look around Alaska's capital city . Complicating matters was the docking of no fewer than four cruise ships at the same time, disgorging some ten thousand tourists on the small town. As you might imagine, it was a huckster's dream. It was like a feeding frenzy among the many shopkeepers along the narrow streets. We were struck by the large number of jewelry stores; I guess a lot of cruise passengers are a bit more well-heeled than we are. Always on the hunt for fresh seafood, we stopped in the Twisted Fish Restaurant for some fish and chips and fish tacos--halibut, of course. These were very good but way overpriced, thanks to the restaurant's proximity to the docked cruise ships. Had we only known, we could have walked a short distance toward town and found local street vendors selling the same food for one-fourth the price. The vendors were cooking and serving from food trailers and even had covered areas for patrons to sit. It would have been a cool lunch venue, so we wish we had waited a bit and cased the place before deciding where to eat. After walking around quite a bit, we returned to the ship. The rain and cold made the experience somewhat less pleasurable than it could have been. 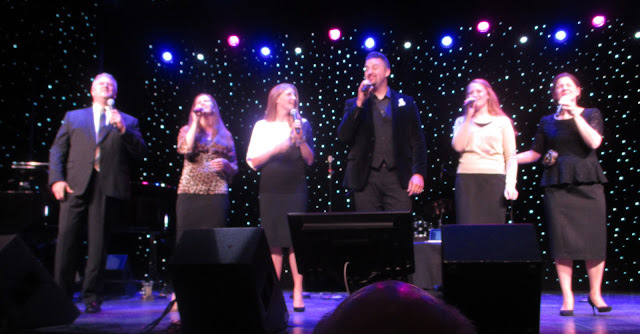 Since we're not all that fond of cruises, we probably wouldn't have taken this one had it not been for several factors that made it seem like a good idea: 1) Seeing some of Alaska--even the tiny bit we'll see on this cruise--is a bucket list item, and we're trying to work on these while we're still able; 2) we don't want to drive there (we're not fearless like when we were young); and 3) most of our favorite gospel groups are providing the entertainment on this cruise. So, we thought cruising was the best alternative, since you can't see much from an airplane. Besides, it's nice to be pampered, fed and entertained for a few days with no responsibilities. The Westerdam is not a large ship, nor is it very new (built in 2004), but it is very comfortable, and we don't have any real complaints. Fortunately, wi-fi is available throughout the ship--for a price--so we are not incommunicado. While we were eating breakfast today, we saw a couple of whales break the surface alongside the ship, and neither of us had seen that before. I didn't get a photo--they were too quick for me. 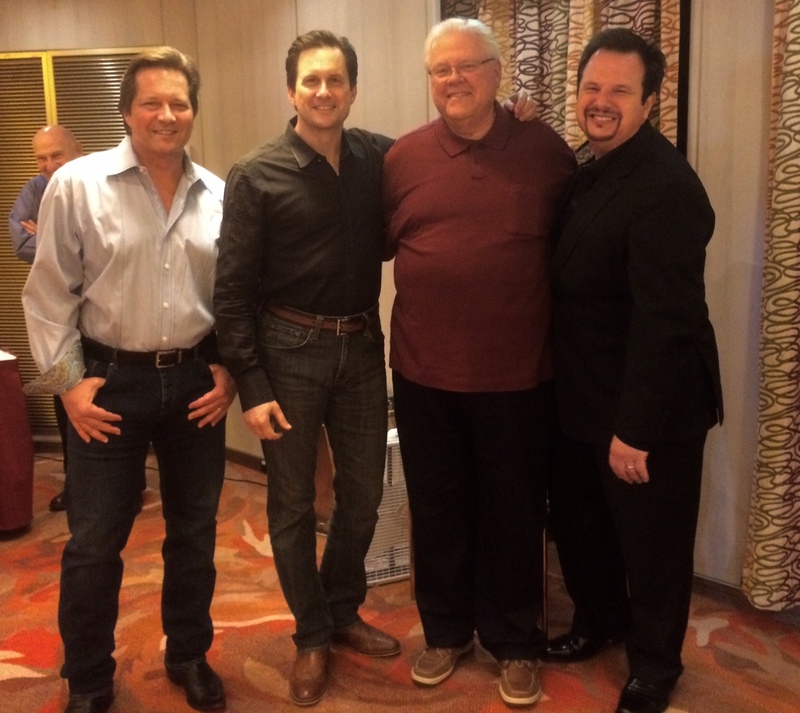 It was a real thrill to meet these artists whose concerts we have attended for years. The intimate venue of the ship made this much easier and, to a person, they were just down-to-earth folks who love to sing and play gospel music. 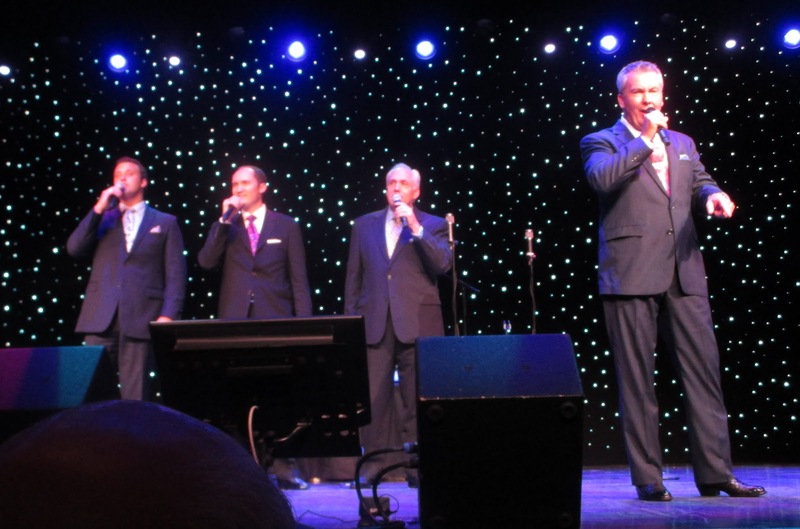 They gave performances every day, and it was a highlight of the cruise for sure. 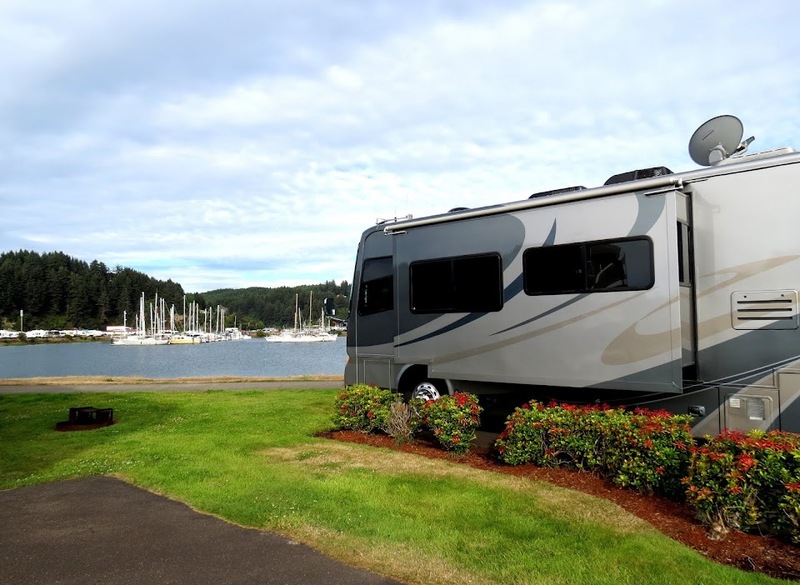 Because of the unbelievable traffic congestion in Seattle, we elected to relocate from Lake Pleasant RV Resort to a hotel downtown to be ready for the cruise ship embarkation on Saturday. We didn't want any hiccups when tickets are as pricey as these. Sandy finally settled on a collection of clothes that she believed would be appropriate for the possible range of weather and activities that might be encountered on an Alaska voyage. After finally closing the suitcases, she declared that she would prefer to sail on a ship where Phannie could be lifted aboard and she wouldn't have to go through making all these decisions. I must admit, it might be easier. Market, of course. We watched them toss the salmon at the fish market and treated ourselves to some hot donuts. The market was very crowded, however, and we didn't spend much more time there. I think we're becoming less and less tolerant of mingling with the sweaty masses. Not that people were sweating, however. It was a very comfortable 75 degrees in Seattle today. 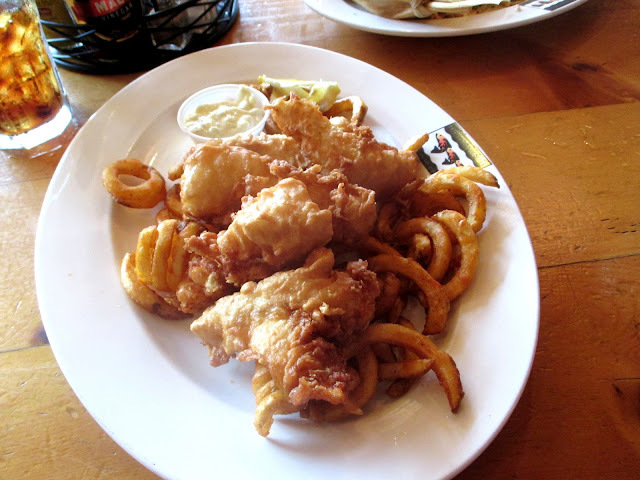 We ducked into Ivar's Seafood Restaurant on Pier 54 for dinner, and it was, of course, wonderful. 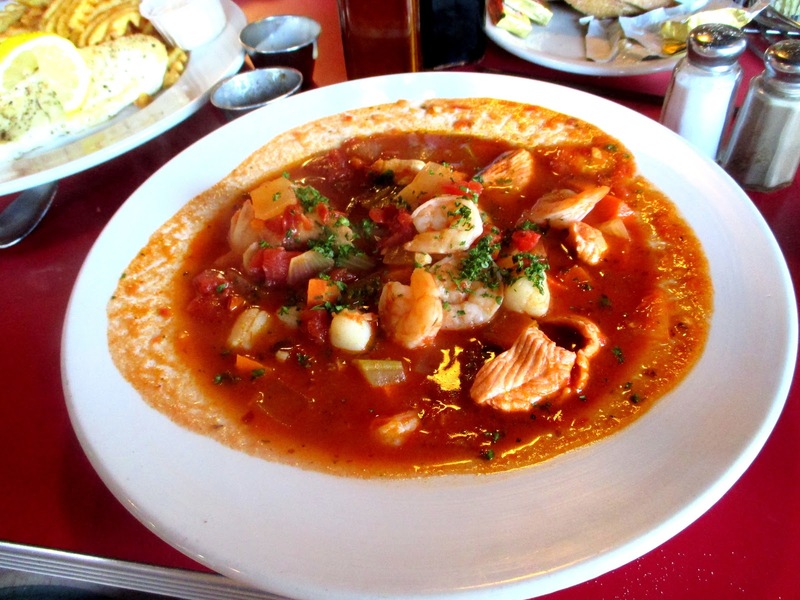 We shared a seafood cocktail, clam chowder, caesar salad and fresh clams in a wine and garlic broth. The next post will be from the ship; stay tuned! This will be a short post, as we just repositioned from Portland to Seattle. We had been warned that the traffic in Seattle was bad, but we weren't quite prepared for how packed the freeways were, and it wasn't even rush hour. We began to notice within 60 miles of Seattle on I-5 that the traffic was pretty much bumper-to-bumper, and by the time we reached downtown, we had come to a stop many times. I don't even want to know what it was like at five o'clock. The park where we're staying has a very helpful program for customers like us who are embarking on a cruise from Seattle. They will reserve you a spot in their "storage" area with electric power for three bucks a day while you are away. Earlier today, I noticed that about six other RVs were parked there, and there were about four open spots, one of which we will occupy tomorrow. Pretty much since we arrived, Sandy has been fussing over what to take on the ship. The luggage that we're not accustomed to carrying or packing is spread out all over the bed, and I notice that she packs certain articles of clothing, then she unpacks them. Then she puts them back, or replaces them with something else. Only the good Lord could follow her thought process, so I don't even try. My contribution to the packing consisted of, let's see, eight articles of clothing, two pairs of shoes, a belt, underwear and socks. Selecting these took about five minutes and resulted in no shortage of frowns in my direction from the little lady. I just smiled, having learned long ago that a commentary from me at this point would probably not be helpful. Tomorrow, we will drive Phannie and Mae to the park's storage area, and a limo will meet us there and take us to a hotel at the waterfront downtown; from there, it will be a short walk to the cruise ship pier on Saturday morning. This will give us a little free time Friday evening to look around downtown Seattle. We weren't able to do much sightseeing today, as we had to stay in and wait for UPS to deliver our two-week collection of mail from home. Oddly, the park doesn't hold in the office UPS shipments for their guests. They are delivered directly to the addressee at the RV space. However, the wait provided a chance for Sandy to catch up on the laundry, so the washer/dryer was humming in the back of the bus for most of the day. She also gave me a haircut, which hopefully made me look even more handsome! Yes, she has been cutting my hair for 39 years; I don't think I've paid for more than a couple of haircuts in all that time. Well, now that I think about it, I probably have paid rather dearly for those haircuts. But she's worth it! My contribution was to cook up a batch of taco soup for lunch. We were more than ready for something Mexican, having been away from Texas for so long, and it turned out really well, if I say so myself. The UPS driver didn't make it to our space until about 5:00 p.m., after which we got dressed and drove to Acadia, a Cajun restaurant on Fremont Street. There were hits and misses with Acadia. One problem is that its theme is upscale Cajun food. Now that is a real oxymoron in my way of thinking. The food enjoyed by real Cajuns is hardly upscale, but it makes up for it in flavor. 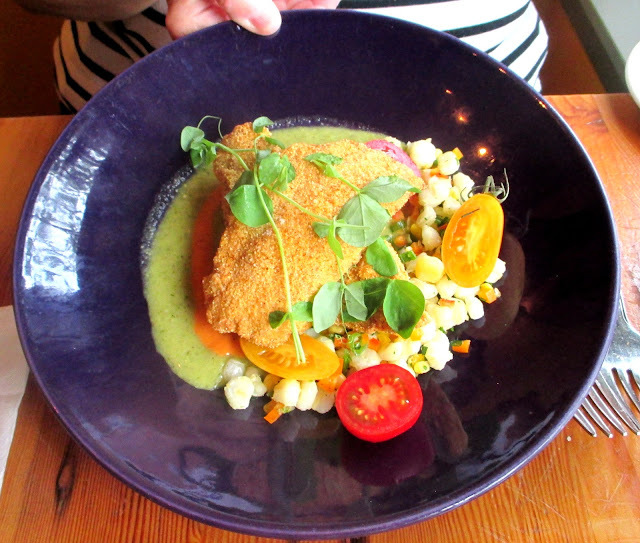 Sandy ordered fried catfish, but it was served on petite hominy and a tomatillo sauce reduction. That's just wrong; catfish is supposed to be served in a plastic basket with some French fries! It was quite good, however, but way too pricey with all the frou-frou stuff. I ordered barbequed shrimp, but it was not the usual fiery concoction that would be faithful to south Louisiana bayou cooks. It was served in a mud-colored wine sauce that wasn't spicy at all. It tasted pretty good, but it certainly wasn't what I expected, and the presentation wasn't very appealing. I didn't bother to take a photo. The star of the meal was the bread pudding, served hot with roasted pecans, a luscious bourbon sauce and fresh whipped cream. 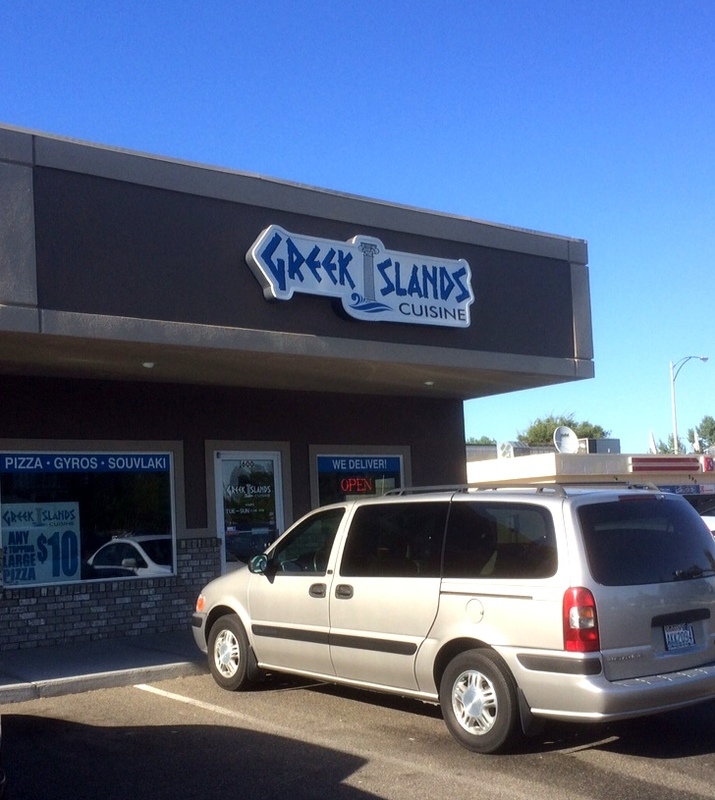 It was beyond good, but it didn't save the restaurant from being excluded from the favorites list. 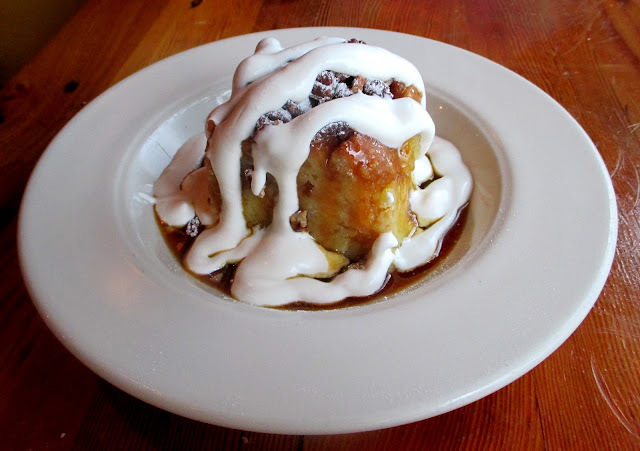 If you go there, go just for the bread pudding. Or two. After dinner, we strolled in one of the many parks in Portland, this one named the Peninsula Rose Garden. It was a perfect evening, the temperature 73 degrees. Fortunately, the heat wave at our arrival in Portland lasted only one day, and it has been very pleasant here ever since. Tomorrow we must head for Seattle to get ready for the Alaska cruise. However, there are things in the Portland area that we still want to see, so we'll probably stop here on our way back. 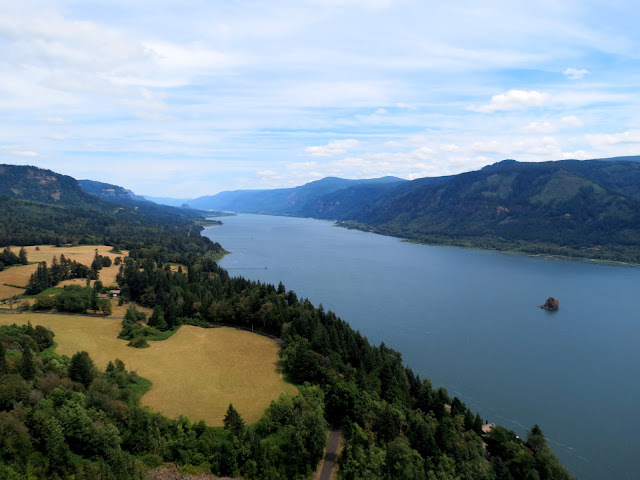 It was my first visit to the mighty Columbia River Gorge, and I was suitably awestruck. The Grand Canyon is perhaps more of a wonder to behold, but the majesty and beauty of the Columbia defies comparison with any other river system I've seen. It looks as though the city fathers didn't see the need to cut down some of the large trees that evidently grew to maturity partially out in the street. It's a wonderful shady place, though, and no one seems to mind. We liked this little town a lot. We also took a brief tour of the Bonneville Dam, erected in the late 1930s as part of the New Deal, and found it very interesting--especially the massive amount of electricity generated by the dams on the Columbia. 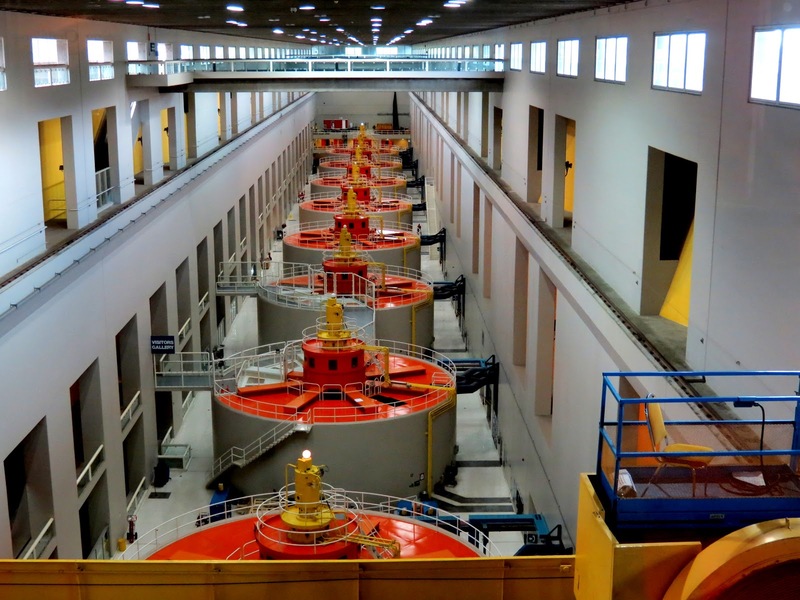 It is the most generated on any river, according to the information center. 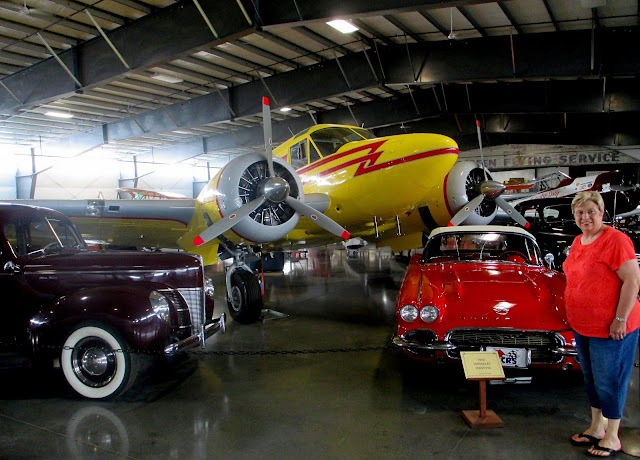 Driving on to Hood River, we toured the Western Antique Aeroplane and Automobile Museum (at the suggestion of Joe and Betty; thank you!) and found it highly interesting. 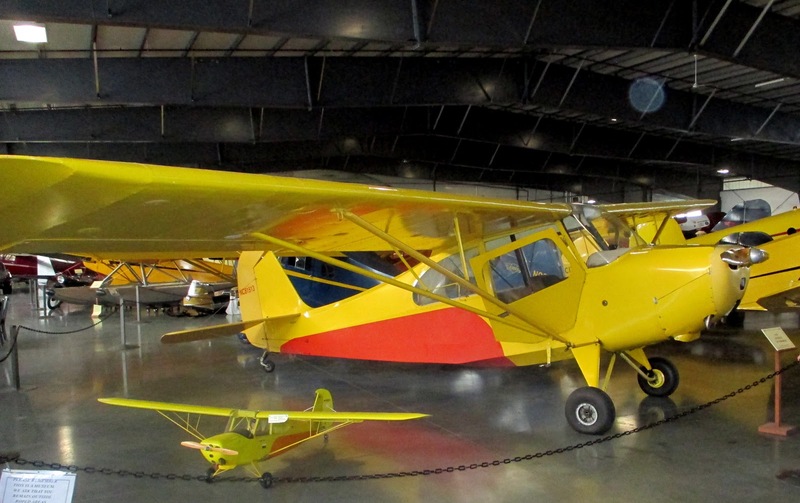 An unexpected surprise was my discovery of a display of not one, but two, types of airplanes that were of profound importance to my flying career. So many memories came rushing back as I took in the sight of this old airplane. I remember vividly a slight sense of anxiety as I flew it around the flight pattern for the first time by myself, a mere kid, knowing I was quite alone and responsible for whatever good or bad was about to happen. Then came the euphoria of having made a fine landing and feeling the slap on my back by the instructor afterward. As I stood there in the hangar, I thought how primitive and fragile was this little fabric-covered airplane compared to the airplanes of today, and I suddenly felt old. The second airplane of great significance was a Beech Super 18, in which I flew a lot of hours carrying mail at night. It was my first real flying job, and I learned more in those five years than perhaps any time since. The airplane was considered among pilots to be somewhat of a challenge to fly, and I confess to a degree of pride in having mastered it, flying at night in all kinds of weather. Standing there looking at it, I could again hear the unmistakable chugging of the Pratt and Whitney R-985 radial engines and could see the engine exhaust flame that was always visible from the cockpit at night. It was quite a moment, and I was so glad I stopped at this place. 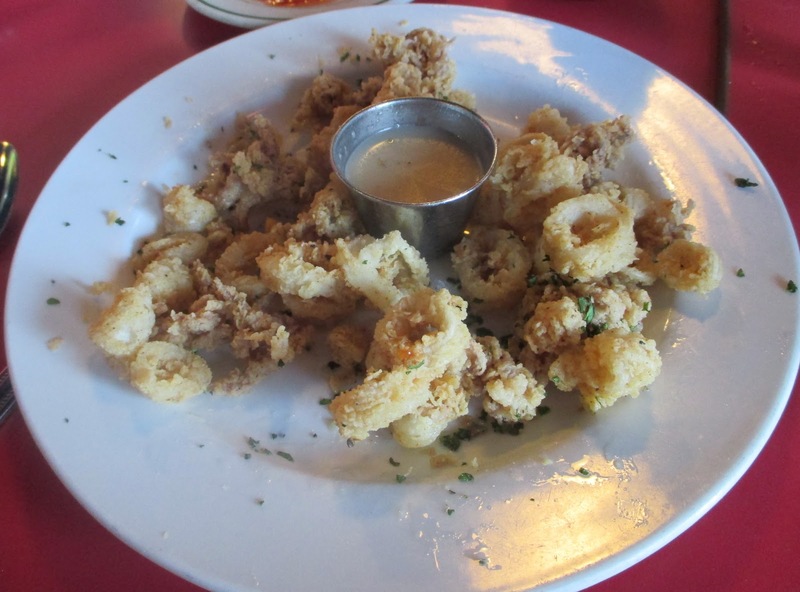 The Calamari appetizer and my cioppino (seafood soup) were superb. Sandy's Halibut filet was delicious, but we thought the serving was a bit skimpy; that was the only blemish on the meal. It is always satisfying to have found a nugget like this, where the meal was half the cost you would find at one of the upscale restaurants. It will definitely go on the favorite restaurant list. What a great day this was! One more day to go in Portland. We were in the process of regrouping today after suffering the shock of encountering triple-digit temperatures here in Oregon. Fortunately, our disillusionment was diffused somewhat by the much cooler temperature that should continue for a few days, according to AccuWeather. After a morning that was as unproductive as we could make it, I fixed one of my Thai-inspired salads that is an absolute favorite and may just be the best salad ever created. The recipe? Once I get it on paper and not in my head, I'll post it. Imagine my surprise when I received a message from fellow bloggers Joe and Betty inviting us to do a meet and greet. We are always delighted to make a face-to-face acquaintance with good folks we already know through their blogs, and Joe and Betty were no exception. Sayler's Old Country Kitchen has been in business in Portland as long as I have been alive (it opened in 1946) and specializes in steaks, seafood and other classic dishes. We opted for steak and fish and chips, and they were wonderful. The steak appears overdone in the photo, but it was perfectly medium rare inside. The steak was served with a ramekin of garlic butter, and the fish was fresh halibut! 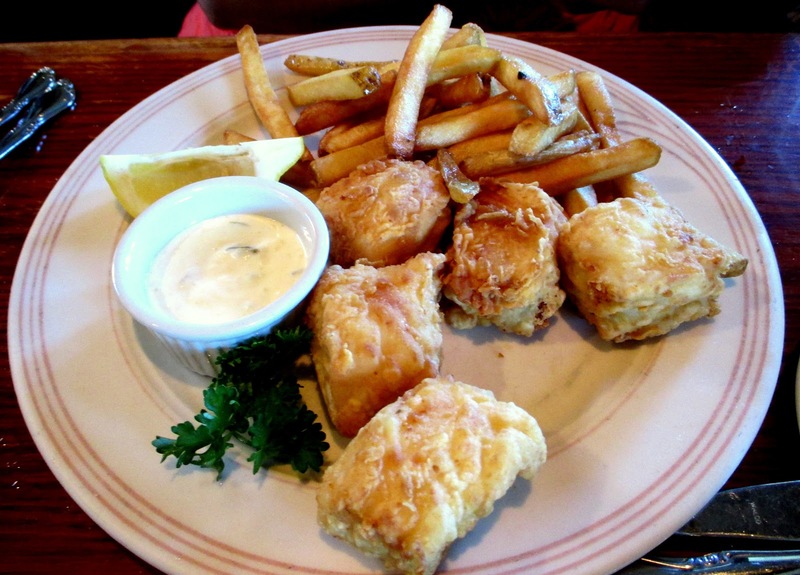 Who makes fish and chips out of halibut-the king of fish? Nobody! Well, except Sayler's, that is. Yes, it was just as good as you might imagine. 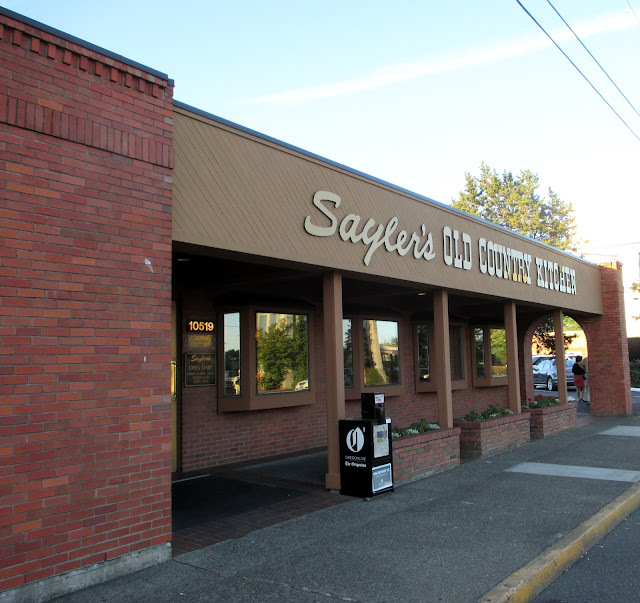 It's easy to see how Sayler's has stood the test of time. It is old school, comfortable and attentive to quality. 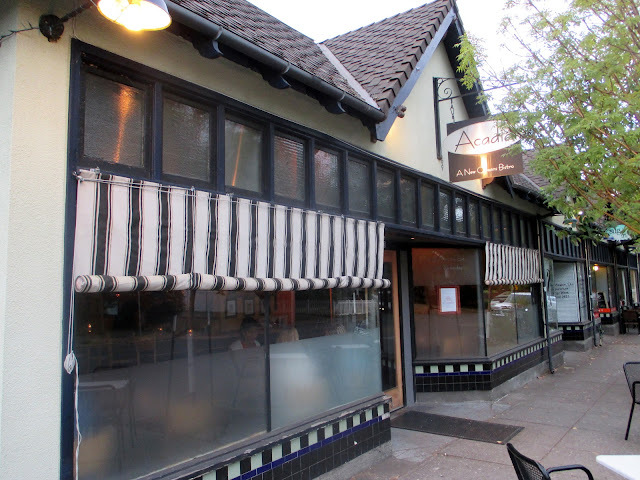 The service was impeccable, and we enjoyed it enough to put it on our list of favorites. Tomorrow will bring some sightseeing, undoubtedly including some of Joe and Betty's suggestions. Thanks again for stopping by, y'all! Thank you, Lord, for this wonderful life, and forgive me if I do not appreciate it enough each day. Is This Portland...or Death Valley? 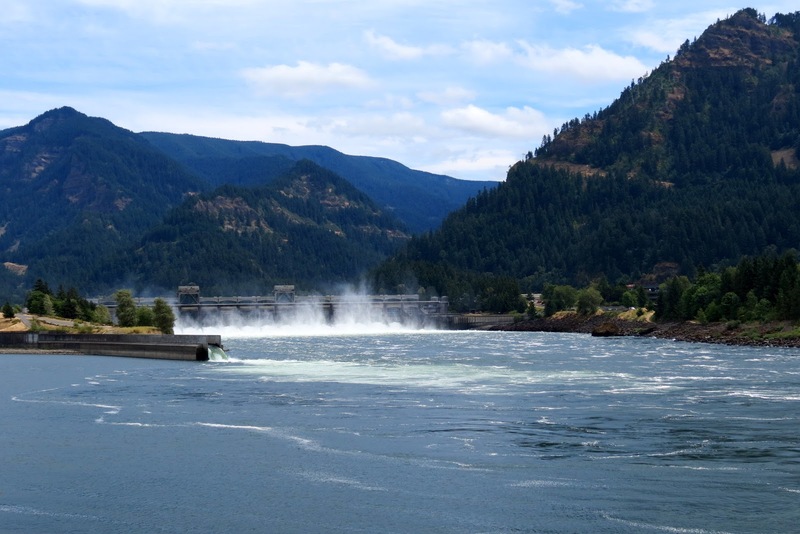 Leaving Kennewick, I chose to follow the Columbia River all the way to Portland on I-84. The first half of the 210-mile leg was pretty unremarkable, scenery-wise. By the time we reached the scenic gorge area, however, my attention was diverted to Phannie's outside air temperature gauge on the instrument panel. It kept creeping upward from the high 80s, then into the 90s and, by the time we reached the halfway point on I-84, it was showing 101 degrees? Could this be right? Have we driven 2,000 miles from where it's hot to where it's hotter? Yep, I guess we have. Was it only a few days ago in Yellowstone when we were using a heater in Phannie? I want the cool air back! When we checked in at Portland Fairview RV Park, the clerk on duty was lamenting the heat wave, saying that all she had had were complaints about it today. However, I think I know what's going on: I'm getting payback for smugly writing blog posts and Facebook entries about our cool surroundings there in the mountains. As has been the case for almost every overnight city, we had difficulty finding a space in an RV park here in Portland. We were glad to find this one, and a drive through this large park verified that almost every site was occupied. This must be good times for those companies serving the RV lifestyle. Once we found our space and parked, bringing all three a/cs on line helped cool Phannie down quickly, but there would be no sitting outside, as we were fond of doing previously in the evenings. 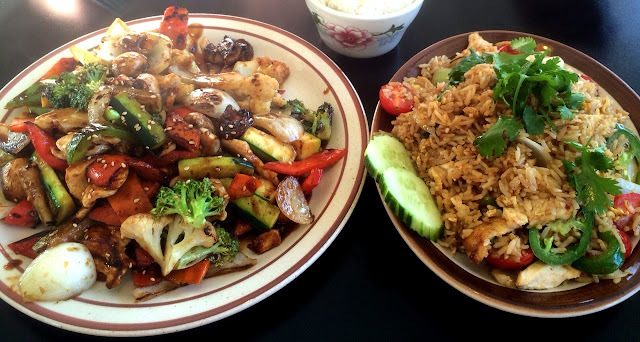 We thought that would meet our rather high standards, so we went in and ordered pot stickers, a chicken and crispy rice salad and a chicken and vegetable stir fry. For dessert, we shared a serving of mango sticky rice. This was one of those times when Yelp got it right. 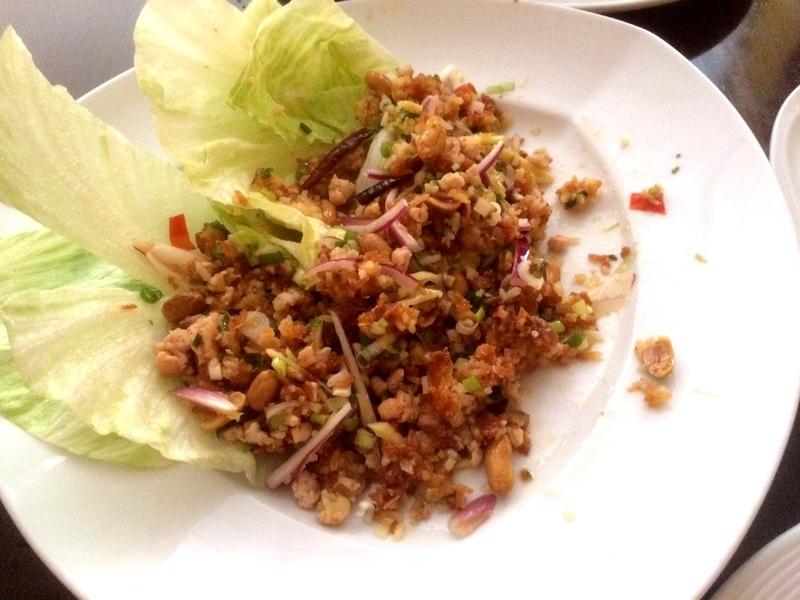 Every dish had been prepared expertly and turned out to be some of the best Thai food we have eaten. I snapped a couple of photos of the salad and the entree', but I forgot to photograph the appetizer and dessert. Did I mention that we were hungry? Fully satisfied with the good meal, we drove around downtown Portland for a while, commenting on the many people present there, even on a Sunday evening. We were also struck by the number of crowded restaurants. 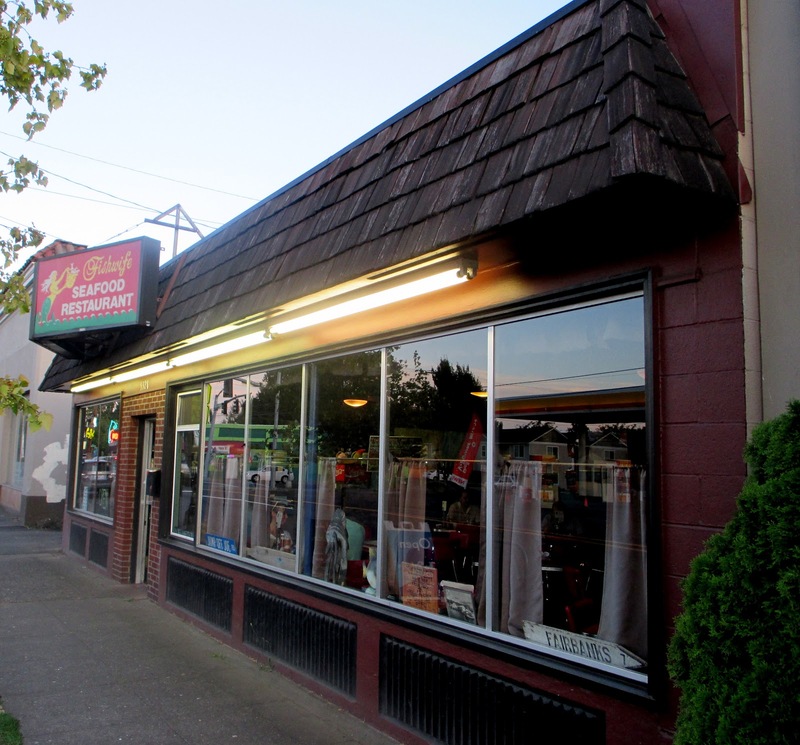 It doesn't appear that Portland will need to do anything to revitalize its inner city. Back at the coach, Sandy did some laundry, and we watched TV for a while. Now we intend to relax for a few days while we do some resting and exploring. Thank you, Lord for this wonderful life; please forgive me if I do not appreciate it enough each day. The route westward from Coeur d' Alene quickly left the mountains behind in favor of mostly arid flatland, dotted with scrub brush or, in those areas with irrigation, various grain crops. It reminded me of the badlands of Texas, except the dust devils here in Washington were bigger than those we see back home. I'm trying to think of something positive to write about this drive, but I'm not coming up with anything. It was, in a word, boring. Kennewick is one of three cities in the vicinity, the others being Pasco and Richland, built as they are along the mighty Columbia River. The towns are not terribly picturesque and, compared to Coeur d' Alene, they are pretty sleepy in terms of night life (or even day life). 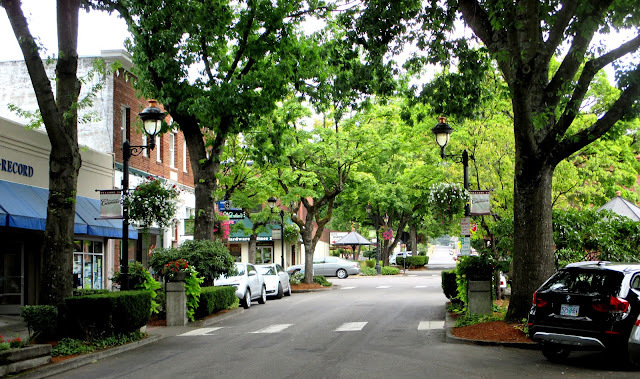 An exception is Richland, where they are revitalizing downtown to a degree with quaint shopping areas that are more easily accessible. Some night life is beginning to show up, and some sort of festival was going on when we were there. 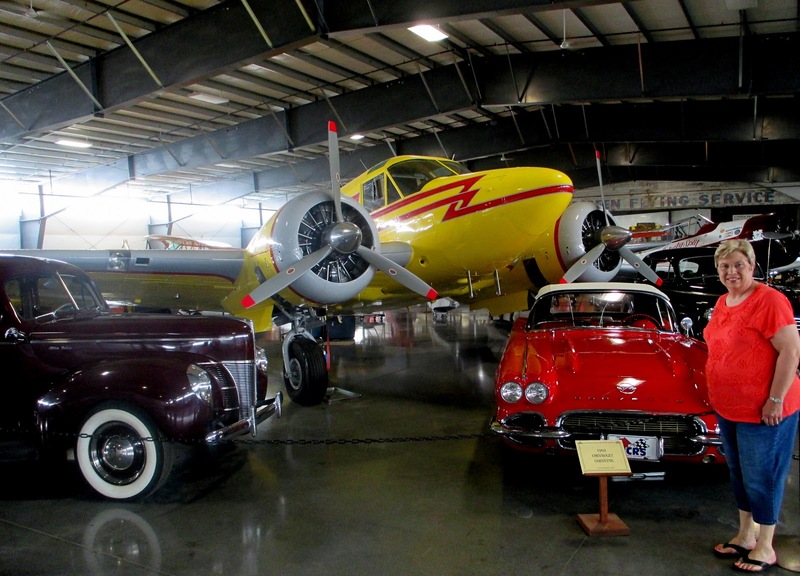 Perhaps most notable about the area is its proximity to the Hanford Nuclear facility. Plutonium mined from the area actually went into making the atomic bombs that exploded at Hiroshima and Nagasaki in 1945. Naturally, we had to try a local restaurant for an early dinner, so we took advantage of a suggestion made by Bill Joyce, one of our readers, who bragged about the Greek Islands restaurant. Since it is far more valuable to get a personal recommendation from someone, we were delighted to hear from him. Even better, we had to try it, and his recommendations were spot-on accurate. 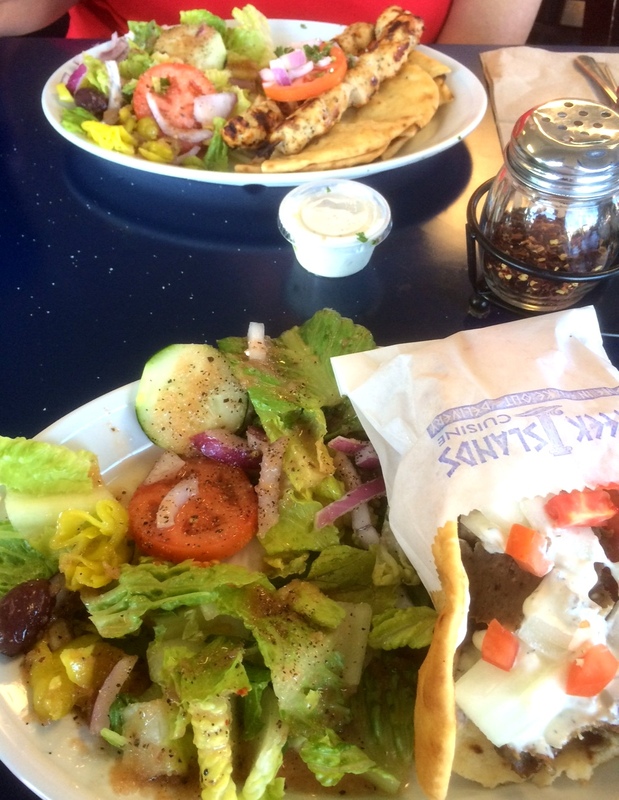 In the photo below, I am having a gyro, and Sandy is having the chicken souvlaki, both with excellent salads. Delicious! (I shamelessly stole bites of her souvlaki.) It goes on the favorites list for sure! 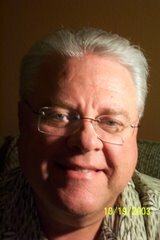 Thank you, Bill, for your recommendation! 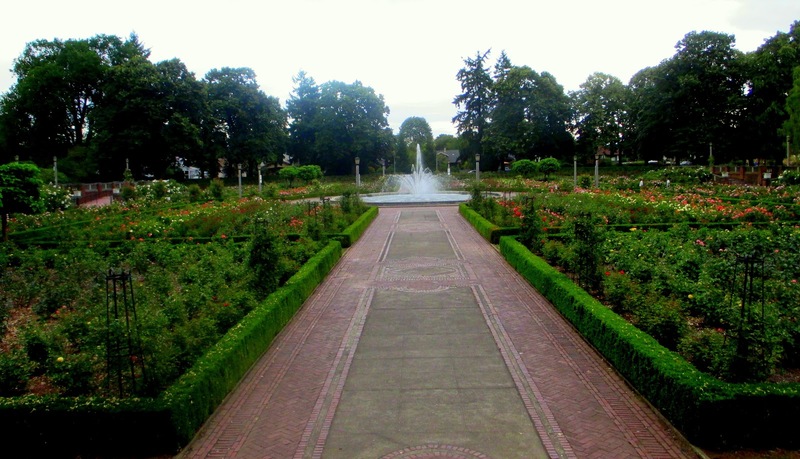 Tomorrow, we'll arrive in Portland, where we'll stay for a few days before continuing on to Seattle. Stay tuned! The leg from Butte to Coeur d' Alene was just under 300 miles today, and it felt like it. We weren't physically tired so much as just tired of being on the road. We decided to bypass Glacier National Park this trip, as we do not want to give it the short shrift that we did Yellowstone in order to meet our arrival schedule in Seattle. We hope to return next August and add Banff, Lake Louise, Jasper and environs to that trip when we don't have a deadline. In any case, we will time it when all the kids have gone back to school. That should lessen the crush of tourists, we hope. We had intended to stay overnight in Missoula, but there wasn't a space to be had in any RV park there. This underscored one of the biggest surprises of this trip, namely, the difficulty in finding room in the RV parks. Never before in our ten years of RVing have we had so many park operators turn down our reservation because their spaces were all full. Why, in previous years, we rarely bothered with reservations at all, and we don't remember being turned away anywhere. Nowadays, we don't dare leave one place without making sure we have a reservation at the next one. Must be the lower fuel prices. 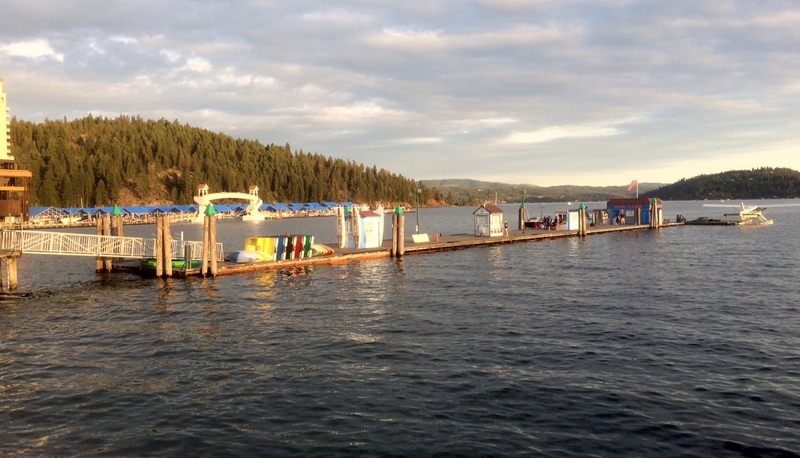 Coeur d' Alene is a lovely city built right at the shore of Lake Coeur d' Alene. Besides being in a beautiful location, it is also a very clean city, with one of the liveliest downtown nightlife scenes we have ever seen. 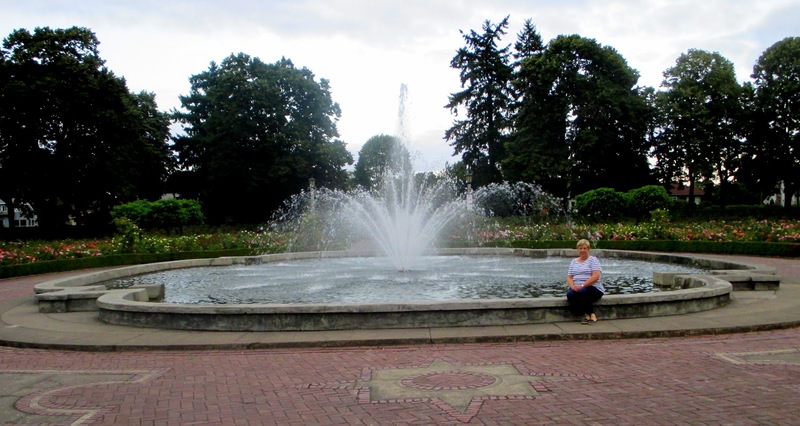 There are flowers everywhere, and many large and manicured public parks. Who wouldn't want to live here? 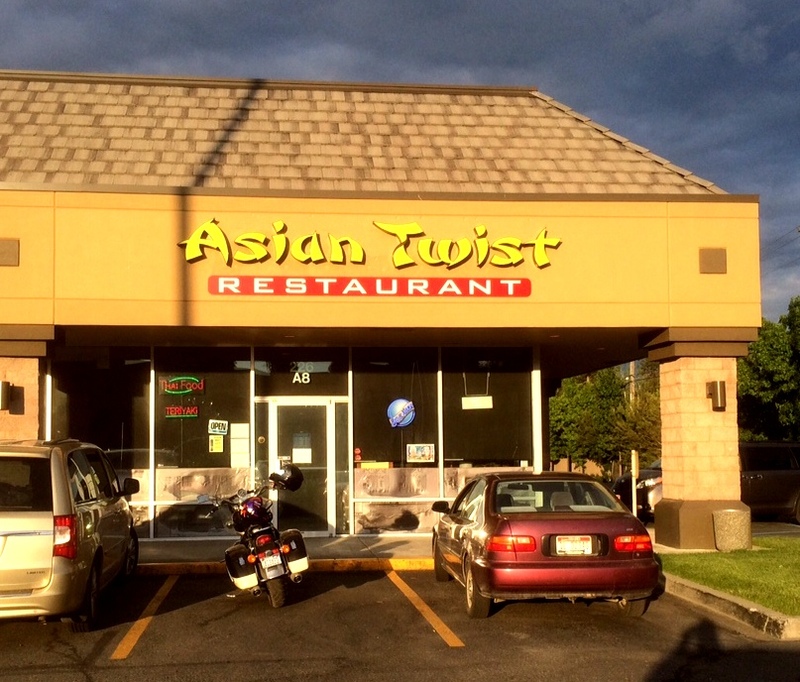 For dinner, we ate at the Asian Twist, a storefront restaurant run by a local family. 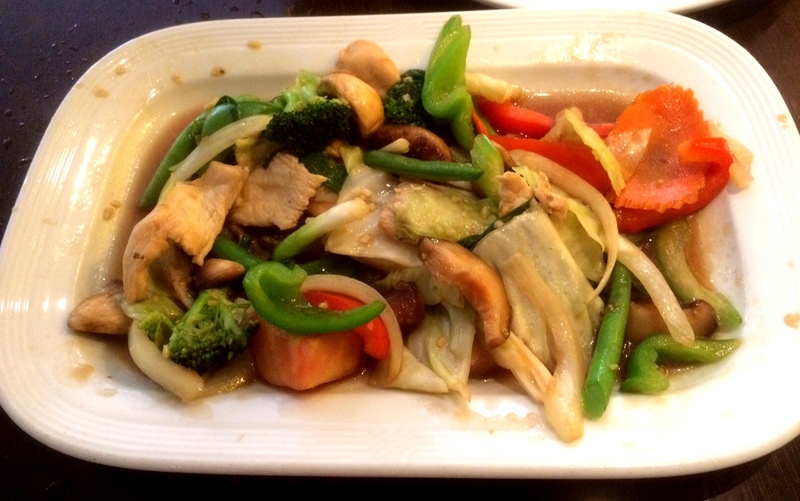 We had a wonderful stir-fried veggie dish with chicken and some Thai fried rice. This place goes immediately onto the favorites list. That's about it for today; Kennewick, WA is next. Thank you, Lord, for this wonderful life; please forgive me If fail to appreciate it enough each day. 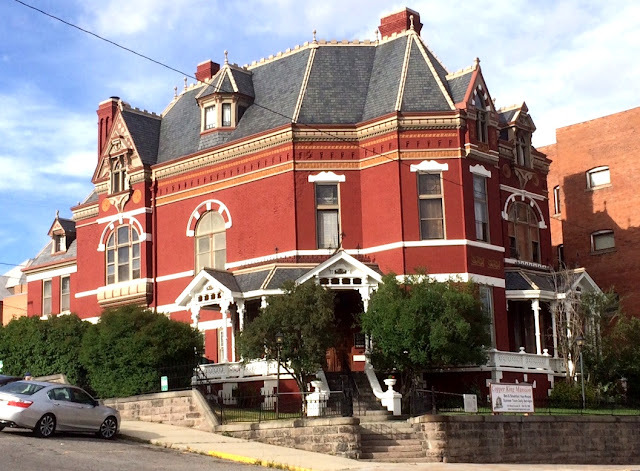 We hadn't planned to overnight in Butte. 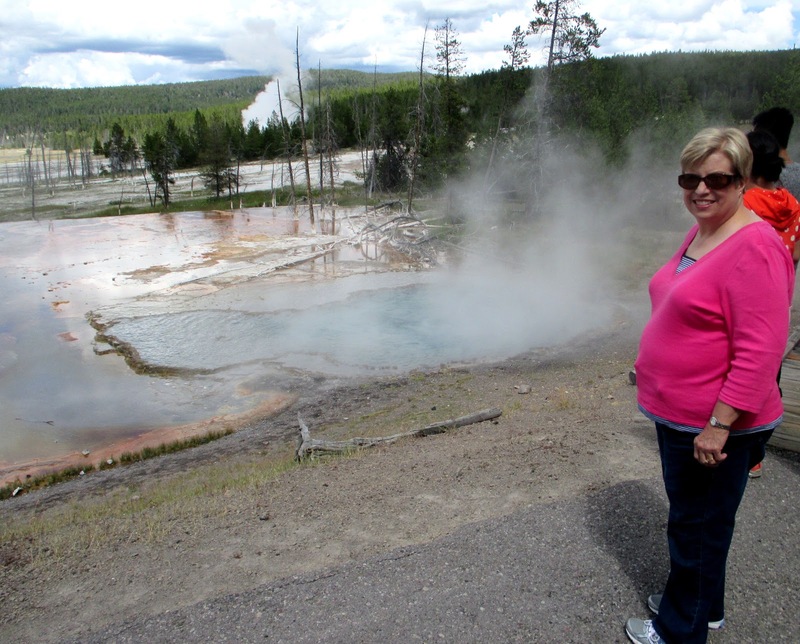 In fact, we hadn't planned to leave Yellowstone a day early; but we did. Several things factored into our decision. First of all, there was Mae. This faithful little car announced via a "check engine" light that something was amiss. This has been one of the most trouble-free vehicles I have ever owned so, while it was overdue for something to break, it still came as a mild shock. Considering that we've dragged that poor car behind Phannie all over the U. S. for four years and driven her 50,000 miles under her own power, I cannot possibly complain. I just wish Chevy still made the HHR. I asked the only garage in West Yellowstone to take a look, but they were booked up, and I didn't think it a good idea to take Mae back into the park, where there certainly is no service possibility in case of a breakdown. We also reassessed our Yellowstone visit and determined that we would need to come back in the late spring or early fall sometime in order to avoid the near gridlock of tourists during the summer. Soon after we arrived at the Butte KOA, we drove Mae to the Chevy dealer without an appointment. They hustled Mae into the shop right away and, in about an hour--voila'! The check engine light was off and they also took care of a recall on the air bags. The problem identified by the check engine light? It was a camshaft position sensor--whatever that is. Since it was still early in the afternoon, we decided to do some sightseeing in Butte. Its most obvious claim to fame is its proximity to a huge copper-mining operation formerly known as Anaconda, and now, Montana Resources. The location of the open-pit mine east of town is unmistakable, the mountains there having been eaten away by giant earth movers. The city proper is splayed up the side of a mountain upon which the original copper mine was dug along with several others in the late 1800s. Much of the downtown architecture is from that era, and much of it has been remarkably preserved. I had the impression I had been transported 100 years back in time, and I almost had a vision of what this rollicking town would have been like with the horses, saloons and brothels that served the hardworking miners when they were not down below. 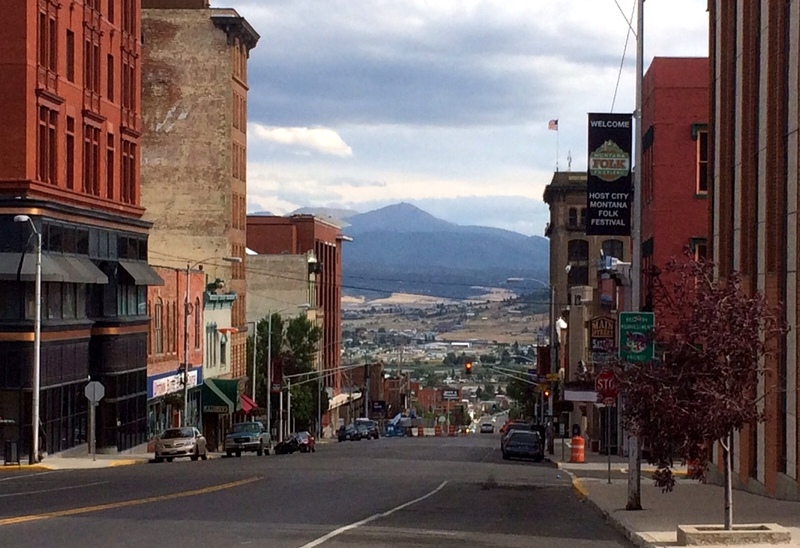 Downtown Butte viewed from the mountain where the original copper mines were situated. The 34-room Copper King Mansion was built between 1884 and 1888 by copper magnate W. A. Clark. It is now a bed and breakfast. 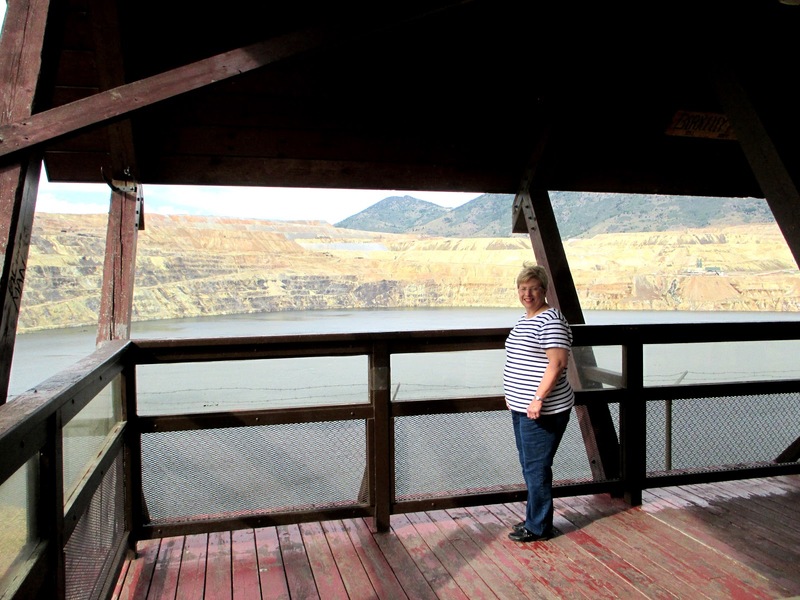 Our interest in the mines piqued, we stopped by the Berkeley Pit, a gigantic open pit mine begun in 1955 and abandoned in 1982. During those years, some 4.5 billion tons of earth were removed to produce about 1.5 billion tons of copper ore. In 1982, the miners went on strike and ceased operating the giant pumps that kept ground water from filling the pit, which had grown to a mile wide and nearly a mile deep. 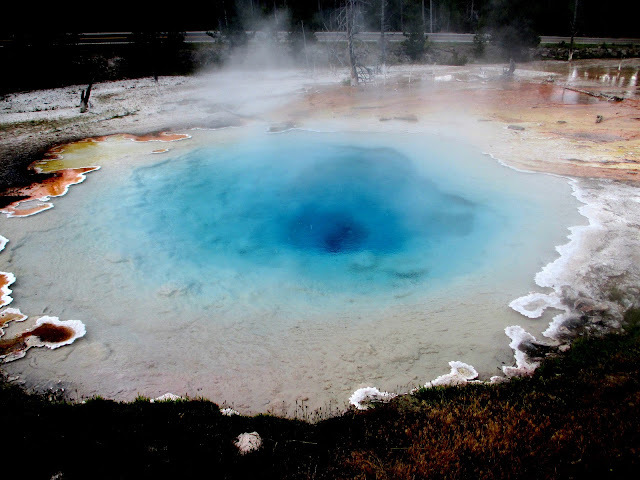 The ground water eventually filled the pit, and the surrounding minerals leached into it and made the water incapable of supporting life. It is so toxic that any waterfowl landing on the water seals its doom, right then and there. It is now an EPA Superfund toxic waste cleanup area. 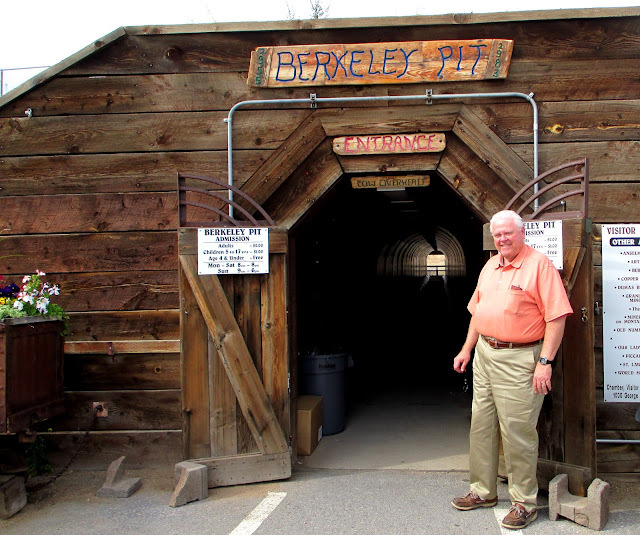 I was surprised to learn that hundreds of miners lost their lives in the mines over the years. I guess I didn't realize the numbers would have been that high. Sandy overlooking the site of the toxic pit. After touring the toxic pit, we were a bit hungry (that sounds odd, doesn't it? 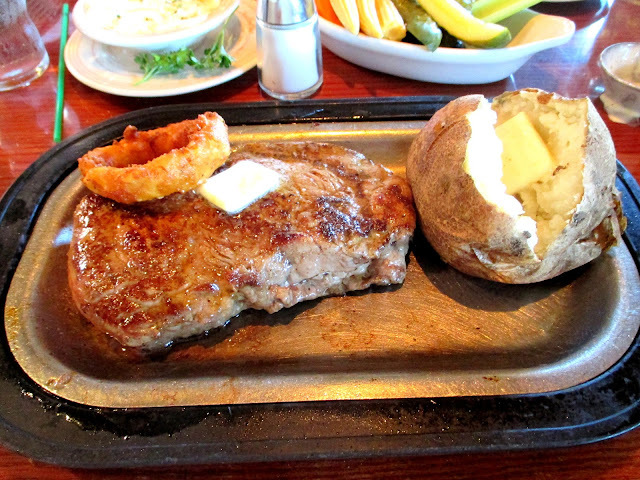 ), so we stopped by The Montana Club, where we enjoyed immensely one of their rib eye steaks that was large enough for Sandy and me to share. With garlic butter on top and a side of shrimp scampi, it was a hit! This restaurant will certainly be included on my Favorites list. Steak at Montana Club. Yum! Tomorrow, it's Coeur d' Alene. appreciate it enough each day. Fellow bloggers and now friends Merikay and Craig graciously agreed to be our guides today for a short tour of some popular sites in Yellowstone. We appreciate so much their suggestions and navigation expertise. We were a bit taken aback right away as we were caught in the crush of vehicles waiting in long lines to enter the park from West Yellowstone. Unfortunately, it didn't get any better after we got inside. We were in a line of cars on the two-line park road that crept along at about walking speed for around an hour. Fortunately, we had a lot of lively conversation to take our minds off the delay! 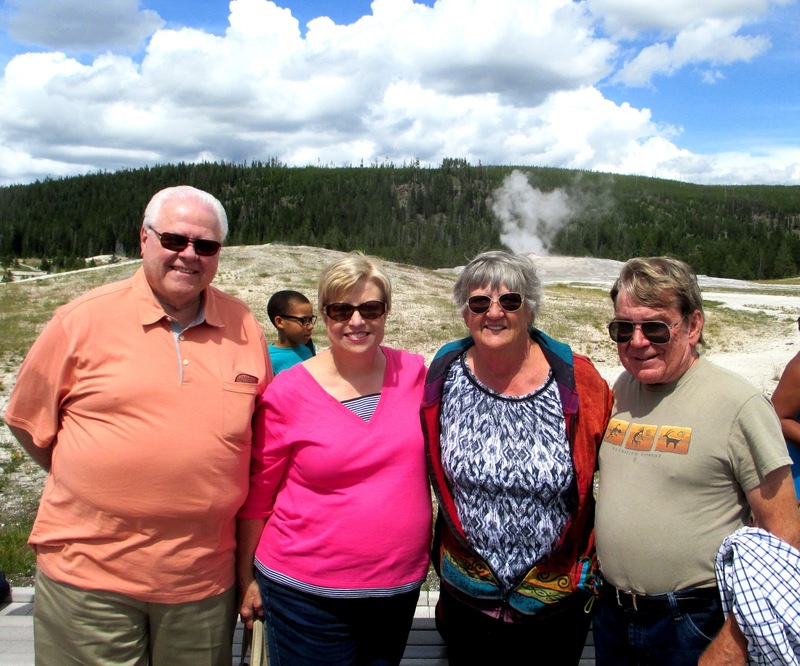 When we finally arrived at Old Faithful, the parking lot was mobbed with cars, and the famed geyser was encircled by perhaps a thousand people. Obviously, my favorable impression yesterday about the visitor scene wasn't all that accurate. We had lunch at the lodge cafeteria and waited for the next eruption, which didn't disappoint. 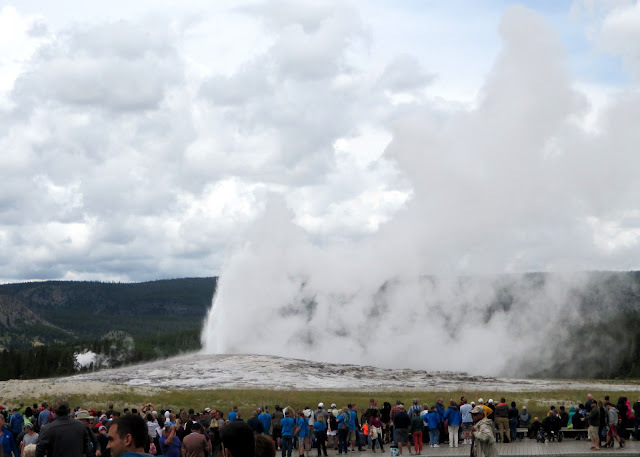 I snapped too late this still photo of Old Faithful's eruption; it was almost over at this point. I have some good video, though. Merikay and Craig on the right--our splendid guides. Arriving back in West Yellowstone, we decided to have an early dinner at the Canyon Street Grill. This is a burger joint with a '50s theme, where the food was pretty good and our friends' company was excellent. 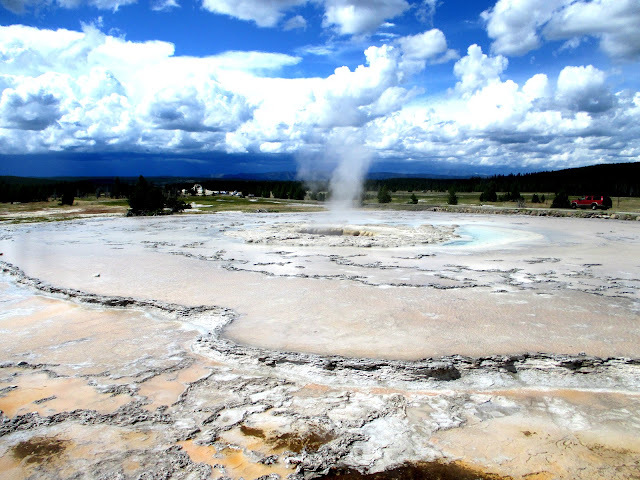 We thought the tab was a bit high, but this is West Yellowstone, and they take full advantage of the touristas. Sadly, the Canyon Street Grill doesn't deserve a place on my favorites list. We were pretty tired after our romp in Yellowstone, so we relaxed in the recliners and watched some TV between cat naps. Thanks, again, Merikay and Craig, for a great day! It's even raining in Salt Lake City!